I first got inspired to enter the dental industry after serving in the US Army during Desert Storm. I wanted to help alleviate pain and improve the smiles of those around me. The thing I have grown to enjoy most is the close, lasting relationships formed with our patients and knowing that I have helped make a difference in their lives. I am originally from New Orleans, Louisiana, but eventually moved to High Point, North Carolina where I have remained since. I have an amazing wife Kim, and two wonderful boys, Justin and Korbin. Outside of work, I enjoy cooking, going out on my boat, and fishing. 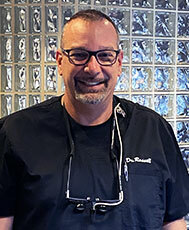 I also do quite a bit of volunteer work at the Mission of Mercy dental clinics where I help offer dental services to those who might otherwise be neglected the oral care they need.